Casino revenues in Macau – already down 58% on last year´s figures – could go up in smoke if a proposed blanket ban on smoking in casinos is enacted. The fortunes of Macau´s casinos are suffering, and suffering badly. The Chinese government´s clampdown on corruption, competition from other Asian casinos, and a partial smoking ban have significantly depleted the number of visitors to casinos located in the special administrative region. Now a proposed blanket smoking ban threatens to knock the stuffing out of the industry – just months after casino operators spent more than $125 million constructing special airport-style smoking lounges on their gaming floors to comply with smoking-related legislation introduced last October. VIP gaming rooms were excluded from last year´s legislation – permitting high-rollers to continue puffing away while gambling at the tables – but the exclusion will not be continued if proposals to be debated today by Macau´s government are passed into law. The proposals being debated have been introduced in response to Beijing´s drive to reduce smoking in public places and dissuade people from smoking altogether. China has more than 300 million smokers, and the demands on the country´s health services are increasing as more smokers contract lung diseases and smoking-associated illnesses. The blanket ban – if passed – will apply to all public places in Macau, and fines for being caught with a cigarette between your lips will increase from MOP 400 – 100k (US $50 – $12,500) to MOP 1,500 – 200k (US $187 – $25,000). Smoking electronic cigarettes in public places will be banned and their sale prohibited throughout Macau. If the proposals are passed, legislation is expected to be introduced by the end of the year and implemented at the beginning of 2016 – with industry experts predicting that a further $3.4 billion could be wiped off of gambling revenues in Macau, threatening jobs not only in the casinos but for the estimated 3,000 – 5,000 employees working for Macau´s VIP gaming promoters. Three of Macau´s major gaming operators – MGM, Sands and Melco – were reported by the Macau Daily Times as being disappointed with the proposals for a blanket ban on smoking in casino; and, although keen not to be seen opposing the government´s policies, commented that an in-depth study should be conducted to assess the impact of the smoking ban on the economy and the community. Other opponents to the smoking ban were less subtle in voicing their disapproval to the ban – the Association of Gaming and Entertainment Promoters of Macau taking out a full page advertisement in the Macau Daily accusing the government of acting in haste and seconding the call for a study to be conducted in order to assess the implications of the ban. The Association argued that the existing ventilation systems in the VIP rooms and smoking lounges prevented other casino patrons from inhaling second-hand smoke, but damaged its chances of appearing credible by suggesting that – if a blanket ban was imposed on casinos in Macau to protect visitors from health hazards – then the government should also ban harmful food additives and cars! 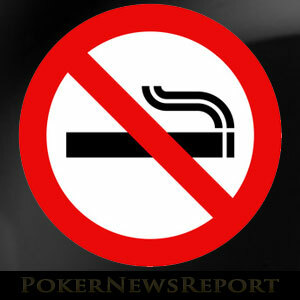 The likelihood is that the Macau government will follow the lead of Beijing by banning smoking in public places. With the sale and use of electronic cigarettes also being prohibited, maybe there is a business opportunity for vendors of nicotine chewing gum. At least that´s not banned – yet!